An exciting new product has recently landed from Heatmiser. 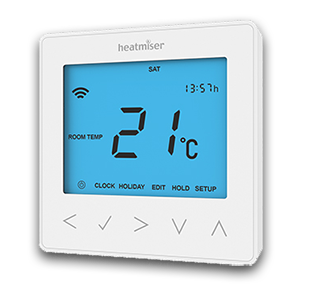 This is the new Heatmiser neo range of wall-mounted thermostat/programmers for heating and hot water. The first thing to notice about the neo programmers is that they look fantastic. The design looks clean, contemporary and stylish. Although there are only two colours – glacier white and sapphire black – a faux-metal finish would not improve their good looks. The controls are limited to five touch controls below the display which makes using the programmer a joy. Setting it up takes minutes and the temperature display is clear and easy to read from a distance away. Although there are only four products in the entire neo range – a thermostat/programmer for heating, a hot water programmer, a neoHub gateway and a mesh network repeater – the system is very versatile. It is very easy (and in fact I have done this myself) to integrate several different heating systems into one. In fact the fact that the range is very limited adds to its appeal as there are not a dozen different variants for specific tasks. 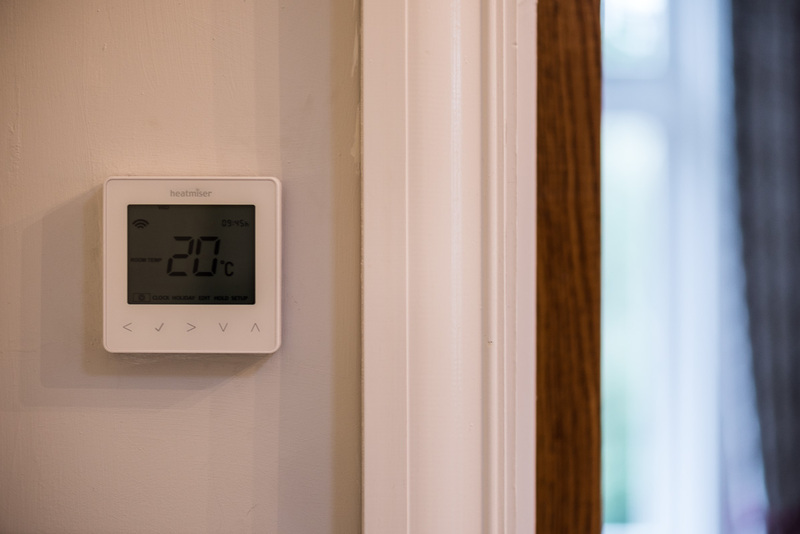 The thermostat/programmer also supports external air and floor sensors meaning that it can be used for electric underfloor heating as well as wet underfloor heating, radiators and so on. Probably the stand-out feature of the neo range is the mesh network function. This means that there is no need for wires to communicate between the programmers and a single point of contact is required between the mesh network and local data network. Heatmiser already have a product with similar functionality – their Wi-Fi thermostat/programmers – but this needs good wi-fi signal strength at each programmer and it also puts an extra load on the local wi-fi. The mesh network works very well (although I have found that it has been defeated by a combination of foil-backed insulation and space blanket insulation) and the mesh network takes a load off the local wi-fi network. The system can be easily controlled by iOS or Android device through the excellent neo app. At the moment this is only available for smartphone-sized screens but I am sure that a tablet version is in the pipeline. The neoHub uses a peer-to-peer communication with Heatmiser’s cloud servers meaning setting the system up for control away from home is very easy. Extra Vegetables also do a driver to allow control by Control4 systems.